I knew that the blog anniversary was up this month, but like it always happens I'm not really a person for dates, I can't surprise somebody on their birthday, I can't feel very excited about my own birthday and I can't plan and make my blog anniversary special. But hey! its never too late. Here I'm, turned my laptop deep into the desk, with many windows open, and fingers on alt, tab. Does my about page say I'm dedicated employee? I don't know where to start in terms of how much I have learned this last year. My husband had been telling me to start posting recipes for months and he even made me a blog once. To his despair, I never really wrote a word. As you may make out, I'm not really good with words, blog often felt more like a task and I was not willing to add to my "to do list" in life. Until one fine day M's friend showed up on an odd time really hungry. I fixed him this quick Indian style chaat and he insisted I pass the recipe to his wife back in India. And because I couldn't go through one more page of strategic management and we were hungry, I made the recipe again next day and posted it. And that had been my approach until few months ago. In the process I started enjoying the whole experience of blogging. I was always a food person. One who loved eating and now the one who loves cooking meals for my little family. While, I still enjoy talking about food to "real friends", I love the fact that I have found people as passionate about food and who don't mind my jumping onto food talks all the time! Yes, the friends I have made here, are the best thing about blogging. Then, of course there are other things. One often makes recipes that have been passed on to you through friends and family. Many a times if not always I google the recipe I have been making for ages, to see if there are other recipes or cookbooks that claim it to be there's. Generally speaking Indian recipe are so generic I don't really think one can claim it. But! But! When you come across a recipe whether or not its author's invention, there is nothing wrong in giving credit. Blogging is like a mini community and one can only make friends here, if you did it right. And food photography! Can I just go ahead put more exclamation marks!!!! At first to be honest, I found it quiet painful. Taking pictures. Firstly because I was horrible at it . And secondly, I never knew more about it than to clicking the click button (that too if M would show me where it is!). Blogging has created a whole new level of appreciation for photography. I look forward to trying new things, new props and different lighting situations now. I have not got any better at it yet but I love that I love it now, if you know what I mean. A good coincidence comes in a way of gift to my readers today. 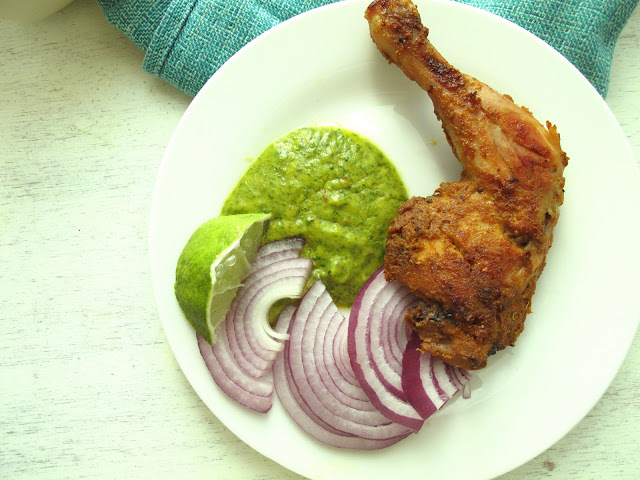 The highest searched keywords on the blog seems to be "tandoori chicken" and fortunately thats what I have for you! I have already posted steamed tandoori chicken so if you wanted to try using tandoori spice differently with steamed vegetables you will love it too. 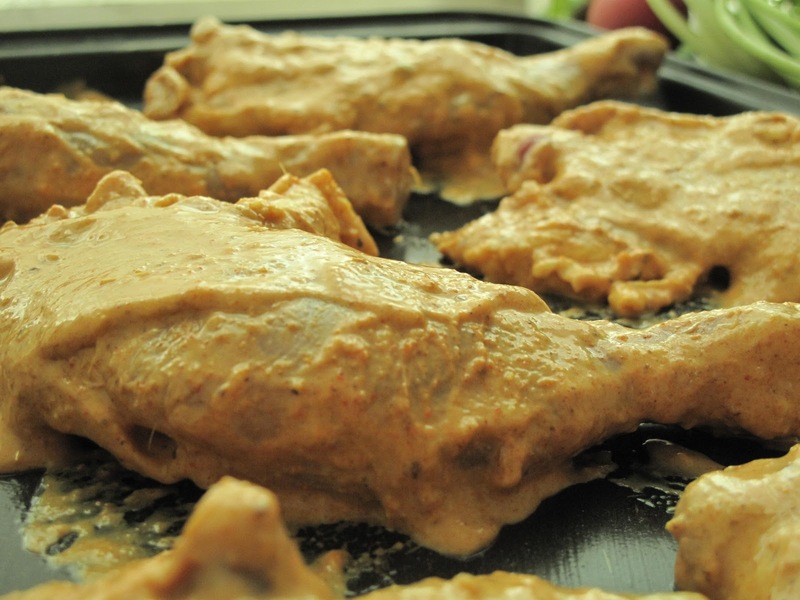 * The yogurt helps to keep the chicken moist while it cooks apart from helping the flavors to marry and the citrus helps to penetrate the flavors into the meat. At least thats what I'm believing. Wash and pat dry the chicken. Make 2-3 diagonal slits. Mix all the ingredients for marination and marinate the chicken preferably overnight. Bake for 35-40 minutes, flipping the chicken once at 20 minutes. 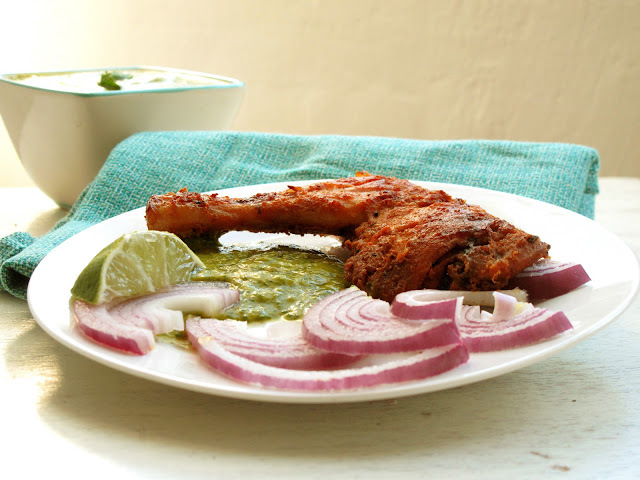 Serve with sliced red onions, mango mint chutney or yogurt based mint chutney with a wedge of lime. absolutely mouth-watering! happy blog anniversary-may you have many more! it took me a while to start blogging, too! i felt the same way about photography, but it's great to see how all of us have progressed and how our blogs have bloomed and have become a great space for us to shore one of our passions and meet so many other great bloggers! Congrats and wishing you many many more. Wonderful pictures Kulsum! perfectly cooked tandoori chicken. congrats on your blog baby's birthday. I heart tandoori chicken just like almost everyone in the world! Thanks for sharing the recipe and congratulations on the bloggiversary! Good job with the photos Kulsum! Congratulations on your one year blog anniversary! I'm a veggie...but I'm thinking about trying this out with some seitan with the chutney. Hope it works! BTW I hear you on the photography. I too have learned so much more because of my blog! Congrats on your blog anniv! This recipes just rocks! Love the way you have cooked the whole leg with thigh and the beautiful color! and congrats on achieving this milestone..may u have many more.. Thank you everyone for commenting and encouraging :) You are the best part about blogging! That looks wonderful--I can almost smell it! I t seems like it's been ages since I've had GOOD tandoori chicken! Congratulations !!! Love tandoori chicken and your pic is making me drool.. Happy anniversary....happy blogging, enjoy cooking:) Love tandoored chicken, yummmmm. Congratulations on your bloggie anniversary. The tandoori chicken looks absolutely lip smacking. Funny you mentioned steaming the tandoori, just last night my husband steamed lamb chops, but only they were in a dry spice mix which we always bbq or pan fry. I love steamed meat. Makes it so succulent. @Kajal Welcome to the blog :) Thanks for stopping by and funny that you mentioned steamed lamb chops I often make them that way with lots of garlic calling is lasuni lamb chops! Thanks for reminding me should post it ! Happy Blogoversary! You have an absolutely beautiful blog! And your photography looks pretty darn good to me, as does this tandoori chicken. Yum! I can't believe I'm just finding you now as I really really love Indian cooking! 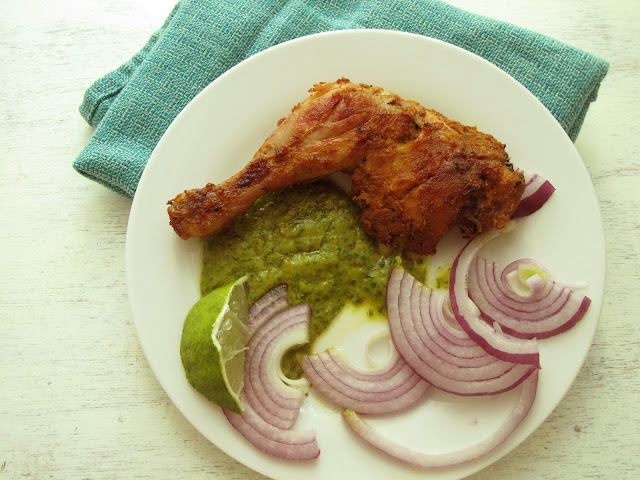 The chicken looks great...bet its fabulous with mango-mint chutney. Happy Anniversary. I think you are fabulous with your words - I don't know why you don't think so? Your recipes and photographs are also fabulous...I love tandoori anything. So thank you for this easy recipe! My boyfriend loves tandoori chicken. He'd go gaga if I made this. Also happy anni! lovely space... i cannot help looking again n again at the awesome snaps... from what you wrote abt ur initial photography, i can see that u hav improved a lot!happy anniversary.. lovely tandoori chicken.. Happy Blog Anniversary Kulsum and I loved reading your post. This looks like a must have tandoori chicken. Your pics are alluring and I can feel the hunger pinch already. Thank you for your stopping by my blog. And congratulations to your first blog anniversary! Well done! Here's to more years of food writing! Okay, I'm drooling right now! 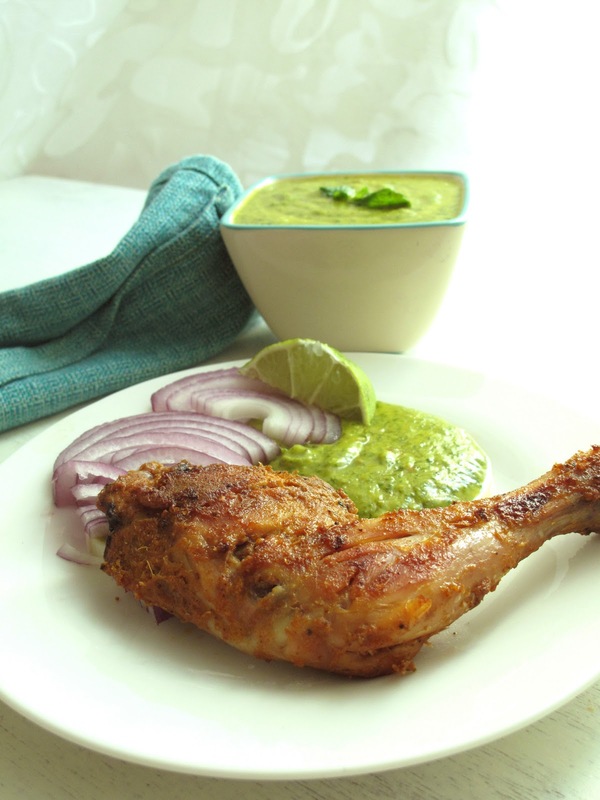 Tandoori chicken recipe is awesome! I'm bookmarking it! Love the mango mint chutney! You know i don't have an oven or microwave ........i don't even know how to cook in it.Tandoori chicken is like everyone's favourite. I loved your steamed tandoori chicken. I'm going to try it at the first instance. Most of your food belongs to dawoodi bohra food culture. Yes, i'm Db too and indian :-) And you are doing a great job of popularising Bohra food culture along with other dishes.I think yours is one of its kind blog.How about a full recipe of kari-chawal or khichra ? And yeah, how to i came to know about your blog ? I googled 'frying onions brown' aka birista. I 'm going to try your recipe. Hi, I have only garam masala powder. Can I use that instead of tandoori marsala? ?